Van Dijke’s Cascade Washer: a very good product to wash and clean your products! We use a very high water flow rate to achieve perfect separation of dirt, yet treating your product gently. The machine is equipped with a hopper for removing the earth lump/stones and with a settling compartment for filtering the sandy soil and clay (which is dissolved into the water) from the water. 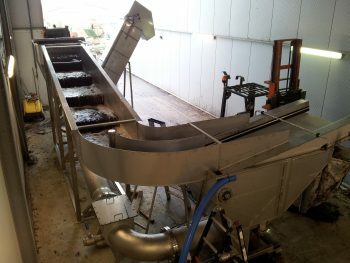 An outfeed-conveyor belt is used to get the product out of the machine. The destoner consist of 2 sections: a receiving hopper and a settling tank. The product is brought into the hopper. The product will float and the rocks/lumps will go (through the waterflow) to the bottom and will settle down on the discharge conveyer. The water flow will take the product out from the hopper to the settling tank. Here the remaining soil and sand will be separated and discharged through a valve. 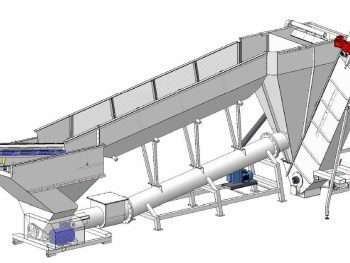 The product out feed conveyer is located in the dirt settling tank. The machine is smart-designed. This means that almost all driven parts are places above the water level. To simplify maintenance, the machine is designed so that all important parts of the system can be easily reached. We welcome you to join us into the future of separating. This future is now!! !